BC Tree Fruits, which represents 80% of the Okanagan’s apple growers, is launching its Broken Ladder brand apple cider in April. How good is this cider? Broken Ladder hits it out of the park. This crisply dry and lightly sparking cider with 5.5% alcohol is just bursting with the aromas and flavours of fresh apples. The pristine and focussed flavours explode on the palate, recalling the experience of taking a ripe apple from a tree and biting into it. The finish is very long. If I were scoring this like a wine, it would be 90 points plus. It is offered in 473 ml cans in a four-pack. And it will be widely available in the British Columbia Liquor Distribution Branch (LDB), as a prelude to a cross-Canada distribution. Michael Daley, the former Vincor and Constellation Brands executive who is the cider project manager for BCTF, says that Broken Ladder enters market that is showing strong growth. Figures from the LDB support this. Cider sales in the LDB in 2014 totalled $72.6 million, up from $63.3 million the year before. Those sales have been climbing for some time. In 2010, the LBD sold $48.9 million worth of cider. “This is a great opportunity to find a value-added opportunity for Okanagan apples,” Michael says. Growers struggle continually to compete in the fresh market, notably with apples from Washington State. There, the apple production is something like 30 times the size of the Okanagan’s production. Washington’s surpluses can, and often do, overwhelm the Okanagan, depressing grower returns. In addition to releasing the cider through retail channels, BCTF is also establishing its own tasting room in Kelowna (at 880 Vaughan Avenue). The irony is that the tree fruit industry has done this before. In the 1950s, at the request of apple growers, a Summerland Research Station scientist, John Bowen, worked with F. A. Atkinson, the station’s director, to develop cider from the Okanagan's abundant sweet eating apples. Traditional cider in Europe is made from tart cider apples, whose flavour is an acquired taste for some. Bowen pressed the juice from Red Delicious and the more acidic Jonathan apples in a seventy-five per cent/twenty-five per cent blend. This juice was sweetened and then fermented with wine yeast, with fermentation stopped before the cider was fully dry. It was then carbonated -- Bowen called it "a half-baked champagne process" -- and bottled. The first commercial quantities were bottled at a brewery in Princeton; the inventory and the process were acquired by Growers Wine Co., which scored a long-lasting success with the cider. As a result of mergers over the years, the Growers brand is now owned by Constellation Brands. The portfolio of ciders under the Growers brand has grown to include flavoured ciders, fruit ciders and ciders made with apple concentrate. BCTF went back to basics, enlisting the research station’s help in creating Broken Ladder. The cider uses six apple varieties: Ambrosia, Granny Smith, Pink Lady, McIntosh, Braeburn and Golden Delicious. BCTF also recruited winemaker Bertus Albertyn (left) to make the cider. Born and trained in South Africa, he is the co-owner and winemaker at Maverick Estate Winery. He also was Burrowing Owl’s winemaker for four years. Ciders are quite competitively priced. Okanagan Premium Ciders, made by Mark Anthony Brands, offer six-packs of 355 ml cans at $9.99. Growers, Lone Tree Cider and Duke’s Cider (the latter from Kelowna’s Tree Brewing Company) sell six-packs for $10.99 while Red Rock Cider is $11.95 for a six-pack. At the high end is Bulmer’s Strongbow from Britain, at $14.95 for a six-pack. BCTF has additional products under development, including a pear cider in a can and sparkling cider in a 750 ml Champagne bottle. At a recent Vancouver tasting of Vancouver Island wines, I observed the “two ships passing in the night” problem that holds back sales of island wines. At one winery table, two guests kept asking where they could find the wines they had just tasted. The vintner kept repeating where the wines are available in Victoria and in the Cowichan Valley. Hello! We were in downtown Vancouver. In fact, we were a block from a Liberty wine store that likely had a limited selection of the wines being tasted, assuming the Liberty buyer had been lined up to support the tasting. Of course, most of the island wineries are small and can sell most of their production right on the island. However, several formerly small producers have recently come into the hands of ambitious new owners. Volumes of wine are growing above the quantities that can be consumed locally. Some aggressive selling is in order. This tasting was organized by Richard Massey, an agent who represents several island producers. Hats off to Richard for herding cats! There are interesting wines across the water, especially from the warm 2013 and 2014 vintages. As usually, time ran out before I completed a round of the room. There are no notes here for Averill Creek nor 40 Knots, both subjects of recent blogs. Blue Grouse Vineyards is planning a major re-opening at the end of May and I expect to blog on that winery then. I also missed the Unsworth Vineyards table but heard very positive comments from other tasters. Here are some of the other wineries and products of interest. Alderlea Vineyards. Roger Dosman, a seasoned winegrower, opened this winery in 1998 and has always made wine just from his picture-perfect 10-acre vineyard. Alderlea Bacchus 2013 ($14) is spicy and aromatic, with notes of grapefruit and peach on the palate. The wine is crisp and refreshing, with a dry finish. 90. Alderlea Pinot Gris 2013 ($15.80). Partially barrel-fermented, this wine delivers layered aromas and flavours of apples, pears and citrus. The texture is generous while the finish is crisp and refreshing. 90. Alderlea Pinot Noir 2011 ($19.30). This lovely silky wine has aromas and flavours of strawberry and raspberry with a touch of spice on the finish. 90. Alderlea Clarinet 2011 and Alderlea Clarinet 2012 ($15.80). This is Roger’s Maréchal Foch. He calls it Clarinet because, as he once said, “it is too good to be called Foch.” It was instructive to taste the two vintages, the cool 2011 and the ripe 2012. I preferred the ripe flavours of the 2012, showing plums, black cherry and blackberry with a touch of coffee and pepper. 90. Cherry Point Estate Winery opened in 1994 and has been owned since 2009 by Xavier (right) and Maria Bonilla. He is a Colombian-born agricultural economist who, with his trademark black beret, looks like a French or Spanish vigneron. Some of his inspiration comes from the wines of Rioja. Cherry Point Gewürztraminer 2013 ($27.90) has aromas and flavours of spice, grapefruit and lime, with a dry finish. 88. Cherry Point Ortega 2013 ($27.90). This fresh, dry white has a flavour palate that includes melon, apple, guava and grapefruit. 88. Cherry Point Pinot Gris 2012 ($24). The pleasing texture of this wine comes from some moderate aging in neutral barrels. There are flavours of pear and apples with a hint of spice and nuts on the finish. 90. Cherry Point Lágrimas Negras 2012 (N.V.). This is one of the winery’s Spanish-influenced wines. Dark in colour, it is a blend of Agria and Castel grapes. It has smoky cherry aromas and gamey flavours of dark red fruits. 88-90. Cherry Point Bête Noir 2011 Gran Riserva (N.A.). This wine is also built with Agria and Castel and is also influenced by Spanish wines. The volatility recalls old Vega Sicilia. The wine has flavours of back cherry and dark chocolate. 87. Cherry Point Pinot Noir Reserve 2011 ($27.70). Aged 10 months in barrel, this wine has aromas and flavours of cherry and raspberry with a hint of oak. The texture is firm. 88. Cherry Point Cowichan Blackberry ($24 for 375 ml). Cherry Point was the first Vancouver Island winery to make the port-style blackberry wine that has become a signature for the island. This is a rich, ripe wine that mirrors the flavours of sun-bathed blackberry. It is sweet but well-balanced. 88. De Vine Vineyards opened in 2010 on the Saanich Peninsula. One of its claims to fame is that it was the first winery in British Columbia to produce Grüner Veltliner. Winemaker Ken Winchester (left) presented a tank sample of Ortega 2014 that I chose not to rate in its unfinished form. The Pinot Gris 2014 tank sample was much more promising. There were two surprises. De Vine Zinfandel 2012 ($24) made with Okanagan grapes, is a ripe and boldly oaked red, with brambly aromas and flavours. This is drinking well now with plenty of upside if cellared. 88-90. The other surprise was a Calvados-like apple spirit. De Vine also has a whisky and a gin in the works. Whatever name is given to the Calvados, it is a generous, soul-warming spirit. Garry Oaks Winery, which opened in 2003, is the oldest of the three Salt Spring Island wineries. Marcel Mercier is another good winegrower and Elaine Kozak, his wife, turns the grapes into very good wine. Garry Oaks Pinot Gris 2013 ($23). This full-bodied wine recalls Alsace, with flavours of apples, pears and melons. The wine has both weight and length, with a crisp, refreshing finish. 90. Garry Oaks Pinot Noir Zweigelt 2013 (Not yet released). Elaine made this unusual blend just before bottling when she concluded it is better than either of the components (it is 60% Pinot Noir). Blending anything with Pinot Noir is chancy but this wine works, with appealing aromas and flavours of cherry and blackberry, leading to a spicy finish. 90. Garry Oaks Pinot Noir 2012 ($24). This elegant wine begins with lovely aromas of cherry and strawberry; these are echoed in the flavours. The texture is seductively silky. The finish lingers and there is a touch of well-integrated oak. 90. Garry Oaks Zweigelt 2012 ($24). This wine is firm and lean with aromas and flavours of plum and blackberry with an earthy mineral backbone. 88. Mistaken Identity Vineyards opened on Salt Spring Island in 2009. It has been for sale for about a year but continues to burnish the assets by releasing good wines. Mistaken Identity Bianco 2013 ($16.99) is a blend of six white varieties grown in the estate vineyard. The wine is crisp and refreshing, with aromas and flavours of pineapple, apple and melon and with a touch of residual sugar to flesh out the palate. 90. Mistaken Identity Pinot Noir Rosé 2013 ($16.99). I am surprised this tasty rosé was not all consumed last summer by visitors to Salt Spring. It is bursting with strawberries, raspberries and red cherries with a touch of sweetness well-balanced with bright acidity. 88. Mistaken Identity Rosso 2013 ($22.99). This is a blend of Zweigelt, Leon Millot, Maréchal Foch and Cabernet Foch grapes. A dry red, it offers flavours of plum and blackberry with notes of coffee and dark chocolate. 88. Mistaken Identity Debut 2010 ($22.90). This is 80% Merlot, 20% Cabernet Franc, presumably from Okanagan fruit since neither of these varieties ripen on Vancouver Island. Several other island producers also release wines made from Okanagan fruit in order to offer the full range that consumers expect. This is a delicious red, with aromas and flavours of black currant, black cherry and vanilla with hints of dark chocolate and coffee. It is boldly oaked. 89. Rocky Creek Winery, owned by Mark and Linda Holford, will celebrate its 10th anniversary this year. The winery opened initially in the ground floor of a residence in Ladysmith before moving in 2008 to a farm in the Cowichan Valley. They came to the tasting with three wines from the stellar 2014 vintage – perhaps the best ever vintage since grape growing began on the island in the 1980s. Rocky Creek Siegerrebe 2014 ($20). This is a classic expression of a variety sometimes called Gewürztraminer on steroids. It has bold spicy and floral aromas and the flavours are a fruit salad in a bowl. 88. Rocky Creek Pinot Gris 2014 ($18.50). The winemaker left the juice on the skins for 18 hours, extracting flavour, aroma and a hint of salmon pink colour. It begins with aromas of rhubarb and citrus that are echoed on the full-flavoured palate. This is a refreshing white, nicely balanced to finish crisply. 90. Rocky Creek Robin’s Rosé 2014 ($18). This is a Pinot Noir rosé (also 18 hours of skin contact) with aromas and flavours of strawberry and cherry. It is finished crisply dry, recalling rosés of Provence. 90. Rocky Creek Pinot Noir 2013 ($22). This wine has aromas of cherry and cranberry, with flavours of cherry and plum and with a Burgundian earthiness on the finish. 88. Tod Creek Craft Cider is a cidery that opened last year in Victoria. It was one of three cideries at the Vancouver tasting. Time ran out before I could taste the products from Merridale Cidery and Sea Cider. Both of these have been in the market for some time and are excellent. Tod Creek Tod Cider ($11.30 for a four-can pack). This blend of cider and dessert apples is refreshing, with a crisp and dry finish. 88. Tod Creek Bamfield Bound Cider ($6.10 for 500 ml). Cidermaker Chris Schmidt uses a dash of maple syrup to finish this cider. It is a full-bodied cider with crisp apple flavours and with a slightly tart finish. 90. Tod Creek Mala-Hop Cider ($6.10 for 500 ml). This is an intriguing hopped cider. If you like the slightly bitter and smoky taste of hops (I do), you will like this well-made craft cider. 89. Venturi-Schulze Vineyards was opened by 1993 by Giordano Venturi and Marilyn Schulze (now with daughter Michelle). They have pioneered techniques for growing wines and they always make interesting, and occasionally eccentric, wines. Not to mention their balsamic vinegar, an exceptional product. Venturi-Schulze Brut Naturel 2010 ($32; $18.50 for a half bottle). The cuvée for this dry bottled-fermented sparkling wine is Pinot Auxerrois and Pinot Gris. No dosage or sulphites have been added. The wine begins with bready aromas, is creamy on the palate, has tangy citrus flavours and a crisp finish. 90. Venturi-Schulze Sassi 2012 ($26). This blend of Pinot Gris and Ortega has a bouquet of aromas and flavours – pear, apple, citrus and melon with a touch of spice from the French oak-aged portion of the blend. 90. Venturi-Schulze Primavera 2012 ($20). This light, off-dry wine is a blend of Schönburger and Ortega. It is crisp and fresh, with notes of citrus and spice. 90. Venturi-Schulze Terracotta 2011 ($28). This is a deliciously eccentric white. Aged 30% in French oak, the wine has a golden hue. It has honeyed aromas and flavours of apricot and nuts, with a spicy finish recalling cumin. This dry wine is 100% Siegerrebe. It is a wine to savour, perhaps with a good cigar. 90. Venturi-Schulze Pinot Noir 2011 ($45). Even though 2011 was a difficult vintage, the winery made a superb silky Pinot Noir with aromas and flavours of cherry and raspberry. The wine was aged in two and three-year-old French oak barrels. 90. Venturi-Schulze Pinot Noir Reserve 2009 ($54.96). The 2009 vintage was hot. Consequently, this is a big wine with ripe flavours of cherry and plum. The wine, aged in two-year-old Nevers barrels, is silky on the palate, with a long and elegant finish. 93. Venturi-Schulze Brandenburg No. 3 2010 ($35.50 for 375 ml). This is another eccentric wine that is incredibly delicious. This amber-hued wine bursts with aromas and flavours of cassis and caramel. With just 7.7% alcohol, it is a dessert wine that is easy to drink on its own because it is not overly sweet; and also pairs well with both savoury dishes and custard deserts. 90. Zanatta Winery, which was licensed in 1990, is the oldest winery on Vancouver Island. The winery’s 30-acre vineyard grows 40 different varieties, including British Columbia’s only commercial planting of Cayuga, a New York hybrid. Zanatta Glenora Fantasia Brut NV ($28.50). This is a traditional sparkling wine from the Cayuga grapes. It is aged at least five years on the lees. The wine begins with aromas of lees and green apples, leading to a fruity palate and a crisp finish. 88. Zanatta Brut Tradizionale NV ($28.95). The cuvée is Pinot Noir and Chardonnay, in the tradition of Champagne. Time on the lees has given the wine a toasty aroma and rich nutty flavours. 88. Zanatta Pinot Grigio 2013 ($17.95). This is a full-bodied dry white with flavours of apple and pear. 88. Zanatta Damasco NV ($16.50). This is perhaps the winery’s most popular white – a 2014 blend that includes Muscat, Ortega and Madeleine Sylvaner. The wine begins with spicy and floral aromas. On the palate, it is fresh and juicy, with hints of citrus and apple. 90. Recently, Averill Creek Vineyards proprietor Andy Johnston hosted a rare vertical tasting of every Pinot Noir made at his Cowichan Valley winery between 2005 and 2012. All of those who attended had tasted some of Andy’s Pinot Noirs but none had tasted them all. It is unlikely that anyone not living on Vancouver Island would have been able to collect such a vertical. It is hard to find Vancouver Island wines anywhere else. That is unfortunate. These are impressive wines from a terroir that, arguably, suits Pinot Noir. “I think it is fantastic that we can make these wines in the Cowichan Valley,” Andy says. “I feel they have more elegance and complexity than most Okanagan Pinots. The style is very different from the Okanagan.” Andy’s views have mellowed: he once argued that the Okanagan is too hot for Pinot Noir. He now admits admiration for several Okanagan Pinot Noir producers. Before he became a grape grower, Andy was a doctor. Born in Wales in 1947, he came to Canada in 1973 and practised medicine in Alberta for about 30 years. In the 1990s, concluding that “there are only so many patient visits in me,” he decided to switch careers. He prepared by working vintages over several years in Italy, Australia, France and New Zealand. While doing that, he acquired a property north of Duncan, on the fairly steep southward slope of Mount Prevost. He began planting vines in 2002, devoting a third of the 12-hectare (30-acre) vineyard to four Pinot Noir clones. He began making wine at Averill Creek in 2005. A New Zealand winemaker helped him in that vintage. Since 2008, his winemaker has been Daniel Dragert, a Vancouver Island native with a winemaking degree from Lincoln University in New Zealand. What he needs to worry about is the variable climate of Vancouver Island. This shows in the dramatic production swings from vintage to vintage. He offers an example of the 2013 vintage. Th3 2013 vintage is a few years away from release, as is the 2014, a vintage that promises to be as bounteous and as high in quality as 2009. While the climate is variable, Averill Creek’s Pinot Noirs still show a remarkable consistency in style from year to year. The Averill Creek Pinot Noir currently in the market is the 2010, modestly priced at $26 a bottle. Look for the 2011 later this year. The winery also still has 2009 Reserve available at $70. Here are some notes on the wines. I scored them all 90 or higher, with 95 for the 2009 Reserve. 2005 Pinot Noir: This wine is at its peak, but what a peak! It is an elegant, feminine wine with strawberries and raspberries in both the aroma and palate. 2006 Pinot Noir: A tasting group favourite, this is a savoury wine with aromas of black berries and leather that are echoed on the silky palate. 2007 Pinot Noir: While oak is rarely obvious in Averill Creek’s Pinot Noirs, the appealing toasty notes in the aroma and palate seem to suggest there was a toasted barrel in the mix this vintage. It also accentuates the quite Burgundian “forest floor” flavours in the wine. 2008 Pinot Noir: This is a fragrant wine with aromas of dried cherries and violets; there is strawberry and raspberry on the palate, with an earthy finish. 2009 Pinot Noir: This full-textured wine appeals with ripe flavours of cherry and plum. 2009 Pinot Noir Reserve: There is more of everything here ... more power, more ripe flavours. The wine was made from grapes picked a few weeks later than the regular Pinot Noir. The winery then cherry-picked the best barrels to make a very impressive wine. So far, it is Averill Creek’s only reserve Pinot Noir, although there likely will be a reserve from 2014. 2010 Pinot Noir: This wine has an intriguing note of white pepper on the nose and on the palate, along with bright flavours of cherry and raspberry. 2011 Pinot Noir: This was a difficult, cool vintage but Andy pulled of a good wine by being brutally disciplined with crop load. He had to drop so much fruit through the season to ripen the grapes that Averill Creek’s vines yielded just ¾ of a ton per acre. At that production, Andy may well be losing money on every bottle of this vibrant, spicy Pinot Noir. 2012 Pinot Noir: Consumers will not see this wine until 2016 – but Andy is sending it to competitions this year to see “what the world thinks.” It is a terrific wine – aromas of spice and cherry that repeat on the palate. This is a wine with lots of finesse and ability to age. Eau Vivre Winery has put the spotlight on Similkameen Valley grapes with its current releases. Of course, Eau Vivre, which opened in 2009, is based on a vineyard near Cawston. The one-hectare estate vineyard, planted primarily to Gewürztraminer, only supports a portion of the winery’s production, which reached 3,000 cases in 2014. However, there has been a significant expansion of vineyards in the Similkameen, enabling Eau Vivre to purchase grapes from its neighbours. The 2014 B.C. Wine Grape Acreage Report, compiled by Lynn Bremmer at Mount Kobau Wine Services, reported 657.6 acres (266.1 hectares) of vineyard in the Similkameen. That has tripled from her 2006 census, when just 335.4 acres were under vine in the valley. With just 15 wineries in the Similkameen, most of those vineyards sell fruit to Okanagan wineries. There is, in fact, a long history of that, and for good reason. The quality of Similkameen fruit is very good. Just ask J-M Bouchard, the winemaker at Road 13 Vineyards near Oliver. In recent vintages he has begun buying grapes from Blind Creek Vineyard, a large and relatively new Similkameen vineyard. J-M just raves about the quality of the grapes. “If there is a vineyard which is going to stand out in five, 10 years in B.C., that will be it,” he told me during a tasting last fall. There are 45 vineyards in the Similkameen and Blind Creek is not the only powerhouse. The recently released reds from Vanessa Vineyards – soon getting its own winery license – included a knockout Syrah and an impressive Meritage. Dale Wright and Jeri Estin, the proprietors at Eau Vivre, have benefited from the increasing number of suppliers in the valley. There is, however, competition for the grapes. While Dale was able to get all the Pinot Noir he needed in 2013 from the Similkameen, he has had to return to Okanagan sources for that variety. He began buying Okanagan Pinot Noir in 2008. “All the other grapes are strictly from the Similkameen Valley,” he adds quickly. Eau Vivre Sauvignon Blanc 2013 ($17 for 311 cases). Grapes from two Keremeos vineyards went into this wine. Whole clusters were pressed to ensure the purest of juice. The juice was fermented at a cool temperature two more than two weeks and then spent two months on light lees, stirred every two months. The result is an elegant Sancerre style white with aromas of lemon, lime and herbs. On the palette, there are herbal flavours along with notes of guava and green apple. The finish is crisp and, with a moderate alcohol of 12.2%, the wine is refreshing. 89. Eau Vivre Gewürztraminer 2013 ($17 for 210 cases). The wine begins with aromas of spice and grapefruit, leading to flavours of herbs, orange zest and lychee. There is good weight on the palate, with an excellent balance between the acidity and the residual sugar, creating a finish that seems dry. 88. 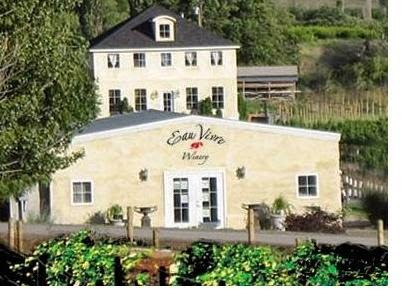 Eau Vivre Riesling 2013 ($19 for 303 cases, $450 for 23 19.5 litre kegs). But for the specifications provided by the winery, one might not have guessed that there is 15.6 grams of residual sugar here. The bright acidity – 10.1 grams – provides such an exquisite balance that the finish of the wine seems crisply dry. The wine, with just 11.3% alcohol, begins with honeyed aromas of petrol and citrus, leading to flavours of lime, lemon and green apple. 90. Eau Vivre Pinot Noir 2013 ($21.90 for 600 cases). The winery, having won a Lieutenant Governor’s Award with an earlier vintage, has made Pinot Noir one of its flagship reds. This vintage is bold and juicy, with concentrated aromas and flavours resulting from cold-soaking the grapes four days before fermentation and then punching down the cap in the open-top fermenters during 16 days of maceration. The wine has aromas of vanilla and black cherry and this is echoed on the palate. The wine was aged 10 months in French oak; 21% of the barrels were new and contributed aromas of toast and bacon fat. The texture is silky. The wine is simply delicious. 90. Eau Vivre Cabernet Franc 2012 ($22 for 205 cases). This wine begins with aromas of raspberry and blackberry. On the palate, there are flavours of blackberry, black cherry and mocha. The tannins are ripe but the texture still is firm enough to support cellaring this up to five years. There is a hint of cedar on the finish. 89. Eau Vivre Buddhafull 2010 ($26). Don’t be put off by the pun that serves as this blend’s name. The wine is serious. It is a blend of 52% Cabernet Franc, 27% Cabernet Sauvignon, 15% Malbec and 6% Syrah. The wine has had sixteen months aging in barrels (mostly French). It begins with aromas of black cherries, red berries and vanilla, leading to flavours cherry, black currant, plum and mocha, with a hint of spice and cedar on the finish. The tannins are ripe, but firm enough to allow the wine to develop further in bottle over the next two or three years. 91. Upper Bench Winery & Creamery has become a must-visit Penticton area winery since Shana and Gavin Miller took it over late in 2011. Initially, the prime attraction was probably Shana’s cheese. She had learned the craft of making cheese at the superb Poplar Grove Cheese Company. The Upper Bench cheeses are equally superb. If the wine took a little longer to impress, it is just because Gavin had a lot of work to do to turn around the vineyard. The wines, which include outstanding estate-grown Merlot and Cabernet Sauvignon, have now taken their place among other quality Okanagan wines. Gavin and Shana recently showed their wines to the B.C. Wine Appreciation Society, to general acclaim. In the Society’s newsletter, Russell Ball wrote: “With Upper Bench only four years young, there is plenty to look forward to from Gavin and Shana. They recently acquired a Naramata vineyard containing Cabernet Franc – a key red missing from their Penticton acreage. About 300 cases of a new 2013 Merlot-Cabernet Franc blend will be released under the title of ‘Yard Wine’. The Upper Bench vineyard was actually planted in 1998 by Klaus Stadler, a former brewmaster from Germany. Three years later, he opened Benchland Winery. When the venture did not succeed, he sold it in 2004 to a local orchardist called Keith Holman. The winery was renamed Stonehill, becoming one of seven wineries owned by Keith. All seven slipped into bankruptcy in 2010. In the court-supervised auction, Gavin, backed by businessman Wayne Nystrom, bought the winery. By then, it was a bit of a fixer-upper. In 2012, the new owners converted one end of the building into a creamery. Gavin cleaned up the wines that he inherited. He has now overhauled both the production facilities and the vineyard. Among other varieties, Klaus planted two acres Zweigelt, the leading Austrian red. In the 2012 vintage, Gavin made a delicious ripe and juicy Zweigelt (see below). Unless you are Austrian, however, you are probably not buying much Zweigelt. Recognizing that, Gavin grafted half of those plants to Cabernet Sauvignon, even through it is a late ripening variety. The winery’s 2012 Estate Cabernet Sauvignon was made with grapes cropped at just 3.1 tons at acre and picked on November 4. Here are notes on the current wines. The three wines marked with * were reviewed in a blog post here last year. The reviews are reproduced because the wines were tasted again at the recent B.C. Wine Appreciation. Upper Bench Pinot Blanc 2013 ($19). The mature grapes used for this wine give it a mineral backbone, along with the variety’s classic apple aromas and flavours. The finish is crisp and dry. 88. Upper Bench Riesling 2013 ($22 for 404 cases). This is a well made Riesling, beginning with honey and citrus aromas that lead to intense marmalade flavours. The balance of acidity and residual sugar is exquisite, with the sweetness lifting the aromas and flavours while the acidity gives the wine a crisp, refreshing finish. The wine is drinking well now but will also age superbly. 91. Upper Bench Chardonnay 2013 ($25 for 396 cases). Half of the wine was barrel-fermented in new French oak. However, the oak is well integrated, subtly supporting the aromas and flavours of tangerine, mango, peach and apple. The wine was not allowed to go through malo-lactic fermentation. As a result, the finish is fresh and tangy. There is a hint of cloves on the finish. 89. * Upper Bench Zweigelt 2012 ($25 for 180 cases). The vines were cropped 3.27 tons an acre. The wine begins with aromas of plum, blackberry and vanilla. On the palate, there are flavours of black cherry, black currant, vanilla and liquorice. (The winery’s notes also speak of Turkish Delight, pomegranate and orange peel.) A hint of dark chocolate emerges on the finish of this richly-flavoured wine. 90. * Upper Bench Pinot Noir 2012 ($28 for 331 cases). The vines were cropped 3.4 tons an acre. This is a robust, earthy Pinot Noir with aromas of black cherry and spice. On the palate, there are notes of raspberry with chocolate and cherry on the finish. The tannins are smooth, if muscular, leading me to think this will benefit from three or four years of further age. 89-90. * Upper Bench Merlot 2012 ($30 for 440 cases). The vines were cropped at 3.63 tons an acre. The wine is a tour de force of aroma and flavour, with a fine concentrated texture. Dark in colour, it begins with aromas of black cherry, mulberry, and black currant. On the palate, there are bold flavours of black cherry, spice, vanilla and chocolate. The alcohol of 14.3% indicates that very ripe grapes were used (the grapes were picked in early November 2012.) 92. Upper Bench Estate Merlot 2012 ($35 for 154 cases). By cropping the estate Merlot vines at just 3.4 tons and acre, Gavin achieved a full-bodied and concentrated wine, turbocharged by aging 20 months in French oak (30% new). The wine begins with aromas of black cherry, plum and vanilla. On the palate, there are flavours of blueberries, black currants and chocolates. The texture is generous but firm enough to allow the wine to age gracefully for 10 years. 92. Upper Bench Estate Cabernet Sauvignon 2012 ($35 for 188 cases). This wine was aged 20 months in French oak (40% new). There is a hint of oak in the aroma, along with aromas of mint and black currant. On the palate, there are flavours of black currants, cola and dark chocolate. The long ripe tannins make this wine approachable now but it should also age gracefully for 10 years. 90. The house style at Kettle Valley Winery has always been distinctive. Bob Ferguson and Tim Watts, the winemaker owners, make wines that are full of flavour and long-lived. It flows from the way they grow their grapes, usually with low tonnages that concentrate flavours and textures. Then when they bring the fruit in, they set out to capture all the flavour that nature gave them. One example is the winery’s gloriously eccentric Pinot Gris. By coincidence, nearby Nichol Vineyard is the only other Okanagan winery that handles Pinot Gris quite like this. Pinot Gris is a white wine grape that, at maturity, develops a pink hue to the skins. Most wineries chose to crush the grapes and press them quickly so as not to extract colour. A lot of excellent Pinot Gris wines are made this way. At Kettle Valley, the grapes are crushed and then left to soak for two days on the skins before being pressed. That extracts a lot of colour. Crucially, it also extracts a lot of aroma and flavour. The result is a bold Pinot Gris that pairs admirably with food. The winery has just released that wine, along with two of its Pinot Noirs. The reserve Pinot Noir, with grapes from four vineyards in the central Okanagan, is the classic bold and ripe Kettle Valley style. The more floral Hayman John’s Block Pinot Noir, which is made from a single vineyard and a single clone. Clearly, Bob and Tim have learned to work with the clone, preferred to have older vines than to replant and wait for years for the concentration of flavour that older vines give. I could not decide which of these Pinot Noirs I liked better because I enjoyed both. Here are my notes. Kettle Valley Pinot Gris 2013 ($24). The wine begins with an appealing bronze pink hue. This wine has aromas and flavours of strawberries, with a touch of white pepper. A portion of the wine also was fermented in barrel, adding texture and complexity. The finish is dry and lingering. 91. Kettle Valley Pinot Noir Reserve 2012 ($38 for 215 cases). This reserve is a selection of the best barrels of Pinot Noir made with grapes from four different vineyards. The wine, which was aged 20 months in French oak, begins with aromas of ripe plums, black cherries and vanilla. This is echoed by the ripe, even slightly porty, fruit flavours along with savoury hints of truffles. The tannins are elegant and silky, with a lingering finish. The powerful wine is appealing now but also should cellar very well at least until 2022, developing further Burgundian complexity. 92. Kettle Valley Hayman “John’s Block” Pinot Noir 2012 ($38 for 96 cases). This is a single vineyard wine from Kettle Valley’s Hayman Vineyard. It has been renamed John’s Block in memory of the legendary wine lover John Levine, who was Kettle Valley’s first customer and who died in 2012. This wine also has spent 20 months in French oak. However, it is a prettier, lighter and more feminine wine that the Reserve. It begins with aromas of raspberry and strawberry that are echoed on the palate. The wine has a graceful weight, with a silky texture and a seductive finish. 92. One of the oldest and most consistent Meritage blends is the one that Inniskillin Okanagan has been producing since 1995 from its Dark Horse Vineyard. It would be surprising to find older vintages in collector cellars. The consumers who collected Okanagan wines in the 1990s were hardly numerous. Okanagan wines were still being discovered in those days. The winery’s current release is from the 2012 vintage. If you have not been collecting this wine, it might be time to consider it. The price still is affordable and the wine, in my view, is built to age at least to 2022. This is the second last vintage that was made by Sandor Mayer, the veteran winemaker who returned to his native Hungary last summer. The 9.3 hectare (23-acre) Dark Horse vineyard was first planted with hybrid varieties in the 1970s for a winery called Vinitera, which opened in 1979. The winery failed twice before it was taken over in 1987 by Alan Tyabji, who promptly uprooted the hybrids in the 1988 grape pull-out and then hired Sandor to replant with vinifera varieties. Born in Hungary in 1958, Sandor had grown up on a farm with a modest vineyard. That led him to study horticulture and ultimately earn a degree in enology and viticulture from a leading Hungarian university. He emigrated to the Okanagan in 1988 (he had relatives here). The timing could have been better: there were few wine industry jobs because two-thirds of the vineyards had just been pulled out. Reviving the Dark Horse Vineyard was one of the few jobs available. Sandor arrived in 1989 to find he first had to clean up a tangle of dead vines, trellis posts and wire. He accelerated the work by setting fire to the dead vines. The blaze was only prevented from incinerating nearby hillsides by the arrival of the Oliver fire department. Sandor feared he would be fired but he was kept and replanted the vineyard. He made his first vintage there in 1992 and spent almost all of his Canadian winemaking career at Inniskillin Okanagan, as the winery has been known since 1996. When Sandor returned to his native Hungary last year, he was succeeded by Derek Kontkanen, a Brock University graduate who had spent most of his career making white wines at Jackson-Triggs, a sister winery to Inniskillin Okanagan. He is also an authority on Icewine (his university thesis was on that topic). Inniskillin Okanagan’s Icewine is as renowned as the reds from Dark Horse Vineyard. Several factors make the Dark Horse Vineyard special. The soils are complex and laden with volcanic minerals. The vineyard is nestled slightly in a bowl, with sun-bathed slopes facing south and southeast. In the early years, Sandor discovered the vineyard was too hot for a few of the varieties planted there, notably Gewürztraminer. But the heat units here are ideal for Bordeaux red varietals now dominating the vineyard. The wines invariably have ripe flavours of dark fruit, with an earthy structure and firm tannins ideal for aging. The technical notes indicate a shift in style, with more robust alcohol levels since 2002 that suggest riper, fuller flavours. The earlier vintages had alcohol levels around 12.5%. Since 2002, the alcohol has been around 14%, which is what one would expect from this sun-bathed terroir. “The lower alcohol level in early vintages was due to above average crop and a vineyard that was still young,” Sandor explained in a recent email from Hungary. Inniskillin Okanagan Dark Horse Vineyard Meritage 2012 ($34.99 for 932 cases). This is 60% Merlot 60%, 30% Cabernet Sauvignon and 10% Cabernet Franc 10%. The three varietals are aged separately in French and American oak for 12 months before being blended. The wine begins with aromas of cherry, cassis and tobacco. There are flavours of black currant, blueberry, espresso and chocolate on the palate. At this stage, the wine has a firm texture that calls for decanting or, better still, the patience to let it develop in bottle for two of three more years. 90. Baillie-Grohman Estate Winery in Creston has made a fast start since opening in 2010. The vineyard, which they began planting in 2006, has now grown to 17.5 acres, on the way to 23.5 acres. Half of that is dedicated to Pinot Noir, the signature variety for this winery. This spring the winery is releasing its first Reserve Pinot Noir. Bob and Petra are former Calgarians who decided on a lifestyle change a decade ago. She had previously been a technology company manager who transformed herself into a good vineyard manager. Bob was a reservoir engineer with Sproule & Associates, an oil industry consulting firm. He retired from that company in 2013 to accelerate Baillie-Grohman’s wine marketing. A New Zealand winemaking connection has been crucial to quality of the Baillie-Grohman wines. When the winery first advertised for a winemaker, no experienced Canadians applied. “We had some very junior applications but we weren’t willing to bet the farm on someone who had a little bit of education and no experience,” Petra says. Like the neighbouring winery, Skimmerhorn, Baillie-Grohman recruited an experienced New Zealand winemaker to come to the northern hemisphere during what is the off-season for southern hemisphere winemaking. Since the first vintage at Baillie-Grohman in 2009, the wines have been made by Dan Barker (right), the owner and winemaker of the Moana Park Winery in Hawkes Bay. Among other kudos on his resume, he was New Zealand’s Young Winemaker of the Year in 2003. Dan’s presence also inspired Wes Johnson, the proprietor’s son, to take up winemaking. Last fall, he completed his Bachelor of Science in Oenology in Napier, N.Z., where he also apprenticed with Moana Park. He has now joined Baillie-Grohman as assistant winemaker. In addition to Pinot Noir, the Baillie-Grohman vineyard grows Pinot Gris, Chardonnay, Sauvignon Blanc, Schönburger and Kerner, varieties that will mature in this relatively cool (compared to the Okanagan) climate. The winery also buys Okanagan grapes to produce the big reds that cannot be grown in Creston. Bob has arranged to buy Merlot and Cabernet Franc from a grower in Osoyoos. Baillie-Grohman Chardonnay 2012 ($25 for 169 cases). There are Chardonnay lovers who lament that boldly oaked Chardonnay seems out of fashion. Well, this is a wine for you. Barrel-fermented and aged in French oak (25% new), this wine has a good interplay of fruit and oak flavours. It has aromas of citrus and oak, leading to buttery flavours of baked apple and nectarine. 88. Baillie-Grohman Récolte Rouge 2013 ($17 for 235 cases). The blend is not disclosed but the flavour suggests that Pinot Noir is the backbone for this juicy quaffer. It recalls Beaujolais with aromas and flavours of Byng cherries and with soft, supple tannins and a medium body. On the finish, there is a hint of spice and mocha chocolate. 88. Baillie-Grohman Merlot 2012 ($22.50 for 653 cases). Because the Creston region is too cool for Merlot, the winery sources these grapes from vineyards near Osoyoos and in the Similkameen Valley. This is a dark wine with aroma of black currants and spice, leading to flavours of black cherry, liquorice, chocolate and coffee. The long ripe tannins give the wine a chewy, generous texture. 89. Baillie-Grohman Cabernet Franc 2012 ($27 for 250 cases). The grapes were sourced from an Osoyoos vineyard growing exclusively for Baillie-Grohman. The wine is delicious, beginning with aromas of blackberries and raspberries. The bramble flavours are lively, with notes of black cherry, blackberry, ripe raspberry and red liquorice. 90. Baillie-Grohman Pinot Noir 2012 ($25). The wine begins with aromas of ripe raspberry and cherry which are echoed in the flavours. Medium-bodied and juicy in texture, the wine is bright and vibrant. I would suggest cellaring this for a year. 88-90. Baillie-Grohman Pinot Noir Reserve 2012 ($45 for 98 cases). This is the winery’s first reserve Pinot Noir, made by selecting the best barrels from the 40 barrels of Pinot Noir made in the 2012 vintage. Three clones went into this wine – 115, 667 and 777. The wine was aged in French oak (30% new). It has also had almost 18 months of bottle age before its official release in April. Even so, this remains a vibrant and youthful wine with dramatic aromas and flavours of black cherry and raspberry. I would suggest cellaring this until 2017. 91. On its website, the Australian wine producer Thomas Hardy & Sons says that it is rated as “Most Powerful Australian Wine Brand” globally. That speaks volumes for the ability of the Hardy’s brand to rise about the various crises the winery has come through since the founder, Thomas Hardy, planted grapes in 1854. That includes an entanglement with the conglomerate madness that swept through the Australian wine industry a decade ago. Bruce Tyrrell, the proprietor of Tyrrell’s Wines, another leading Australian producer, gives some of the credit to Bill Hardy, a veteran with 42 years in the business. He is now the brand ambassador for Hardy’s. Both were among the Australian producers at this year’s Vancouver International Wine Festival. Bruce told me that Bill Hardy, besides being one of the nicest individuals in the Australian industry, logs countless miles each year, selling the Hardy’s brand to the wine trade and to consumers. Bill is the fifth generation Hardy behind the family brand. And there is a sixth generation emerging. The original Thomas Hardy was 20 when he emigrated from Britain in 1850. He tried to make his fortune as a gold miner and, when that did not work out, he became a butcher. He was so successful that, a few years later, he bought 46 acres for his first vineyard. He has sometimes been called the father of winegrowing in South Australia. Hardy continued making wine until 1890, turning the job over to a nephew so that he could concentrate on the business of what had become one of Australia’s leading wineries. The company was sound enough to survive the destruction of its original winery by fire in 1904. His son, Robert, took over running the company in 1910, two years before Thomas Hardy died at the age of 82. A nephew, Thomas Mayfield Hardy, took over the wine company in 1928, only to become part of one of the greatest tragedies in the Australian wine history. He died in an aircraft crash in 1938 that also took the lives of two other leading Australian winery owners - Hugo Gramp of Orlando and Sydney Hill Smith of Yalumba wineries. His widow, Eileen Hardy, became legendary as the matriarch of the family, raising three Hardy sons. The winery honours her by labelling some of its best wines with the Eileen Hardy label. One of those sons was Sir James Hardy, who took over in 1980 when an older brother, Thomas Walter Hardy, died of cancer. While he served as chair of the company, he was perhaps better known as a great yachtsman and an America’s Cup contender. The winery’s expanded in both domestic and overseas market from the 1970s through the 1990s. That success attracted the attention of Constellation Brands, the American company that now is the world’s largest wine company. In 2001, Constellation took over Hardy’s for A$1.85 billion. Apart from the astronomical price, there was logic behind the deal. Hardy’s had very strong distribution in Britain while Constellation’s brands were weak there. Because the reverse was true in the United States, the synergy of the merger seemed obvious. “We kept our end of the bargain,” Bill Hardy says. Constellation got better penetration in Britain but the Hardy’s brands did not get the lift they expected in the United States. Constellation’s timing was terrible. It had waded into the Australian wine industry that, as a result of vineyard expansions, was swamping the world with wine, a lot of it called YellowTail®. By 2011 Constellation gave up trying to make money with Australian wine. It sold 80% of Hardy’s for A$290 million to a private equity company in Australia. The current owner of Hardy is called Accolade Wines, a focussed Australian company that has put together a portfolio of premium brands. The legendary Grant Burge winery has also been acquired by Accolade and Grant Burge himself is now a brand ambassador as well. The apparent strength of the Hardy’s brand likely is due to the good value its wines offer. The brand is well represented in British Columbia Liquor Distribution Branch. The listings include three $10 wines in the Hardy’s Varietal Range; four in the Hardy’s Stamp Series Range priced from $11 to $13 a bottle and $20 for a 1.5 litre Riesling Gewürztraminer; as well as a Nottage Hill Chardonnay at $12 and Nottage Hill Shiraz at $14. At the wine festival, Bill Hardy was pouring some of Hardy’s premium wines, including two recent releases that bear his name. He is clearly proud of that honour. One member of each generation of the family has a wine named for a leading individual. Hopefully, some of these wines will also make it into the British Columbia market. William Hardy Chardonnay 2013 ($16). This wine leans toward Chablis in style. It is crisp and refreshing with notes of citrus and apple. 90. Eileen Hardy Chardonnay 2010 (N/A). This is an exceptional Chardonnay made with grapes from two cool climate vineyards – one in Tasmania and one in the Yarra Valley. Burgundian in style, this barrel-fermented wine has toasty notes in the nose and flavours of tangerine over subtle new oak. In Australia, where the Eileen Hardy Chardonnay wines have a long list of gold medals and best of show awards, this sell for about $65. 93. William Hardy Barossa Shiraz 2012 ($16). This is a big juicy wine with aromas of black cherry and mulberry that are echoed on the generous palate. 90. Hardy’s Tintara McLaren Vale Shiraz 2012 ($30). This wine is named for the McLaren Vale winery that Thomas Hardy bought in 1876. The wine is rich in texture, with vanilla and black cherry aromas. On the palate, there are flavours of black cherry, dark chocolate and coffee. There is a long and satisfying finish. 92. Hardy’s HRB/D636 Coonawarra Cabernet Sauvignon 2007 ($35). HRB stands for Heritage Reserve Bin. This wine is 90% Coonawarra grapes and 10% Margaret River grapes. It is a full-bodied but elegant Cabernet Sauvignon with black currant aromas and flavours of black currant with a hint of tobacco and cedar. 91.